Recently mentioned on forum I was converting this car. 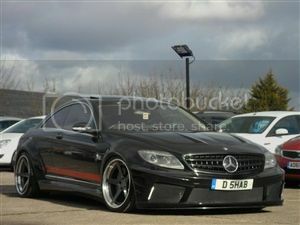 Merc C65 AMG 6L V12 Bi-Turbo modded with straight through exhaust, bigger intercooler and chipped. Standard is over 600bhp, this one makes 800bhp! 220Mph on the clock and it may just about reach that speed because it's had the speed limiter disabled. LPG system spec: 2x 80 litre tanks (one toroidal, one cylindrical) both with 8mm outlet valve, separate Faro pipe runs go between each tank and a reducer, there are 2x Romano reducers, each reducer feeds 6 discrete MJFX injectors... So 2 tanks, 2 reducers, 12 injectors, 2 ECU's. There are no balance pipes anywhere on the system, that's the best way to go on this install (will explain why if asked). 2 X ECU's are KME NEVO, the owner wanted a single changeover switch fitted so the ECU's are networked together to be controlled by the single switch. Fully converted engine, not quite ready to hand back to customer when I took this pic at the side of the road... but you can tell it's going to be tidy, I just had a bit of fetling to do with the under bonnet Faro and fuel return system. This install would probably have to be tidy anyway, as long pipe runs etc wouldn't have worked. While on the subject of fuel returns - As usual after fitting a fuel return I kept close to base at first during calibration pending further road side checks. During such check I found the pipe supplied with an off the shelf fuel return system was ballooning under the car's very high 540Kpa petrol pressure, so I drove immediately back to base and swapped the pipe to much thicker and stiffer 8 bar rated stuff, which took some persuading and heating to fit. Not really the fuel return supplier's fault as pipe supplied is only meant to run on the low pressure side between fuel jet and tank - but would think a lot of people wouldn't think twice about fitting and forgetting the same stuff even on the high pressure side and even on cars like this... On these cars the flexible pipe between body and engine is steel braided, it wouldn't be a good idea to remove the braiding to cut the flexible pipe. I cut the foot long flexible link pipe that runs between the body and the engine, because it just bolts in so could easily be replaced, but I cut it on it's solid pipe section not on it's flexible/braided section. The car idles with 2ms Pinj at 540Kpa petrol pressure which is not manifold pressure referenced, making setup/calibration a bit more difficult than it otherwise would have been. Before the turbos kick in the petrol injectors pulse for only 7ms with manifold pressure at atmospheric. Given this info I knew very high flowing LPG injectors along with high LPG vapour pressure would be needed. The MJFXs have 3.2 nozzles and the Romano reducers will go to way above 2 bar, they will also flow a lot of gas, are quite small physically and have a handy piping arrangement. The KME ECU's would be capable of petrol addition if necessary and have the master/slave ability - the owner only wanted the one change-over switch. 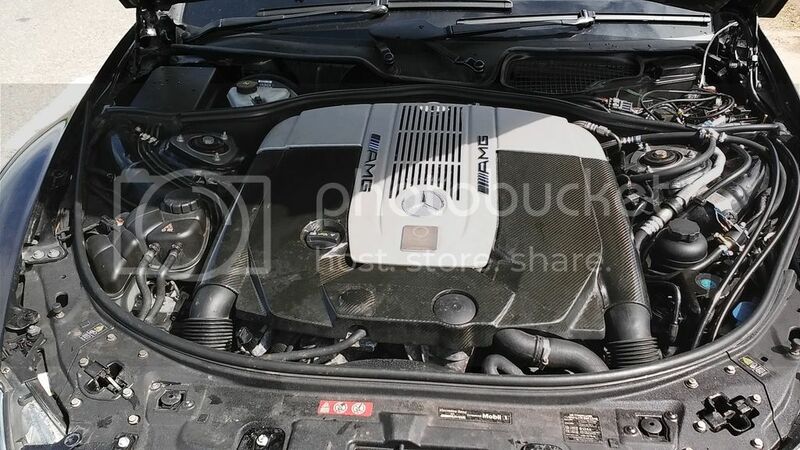 This is the fully LPG converted engine bay, you cannot really see any LPG components except for the ECUs beside the battery and the petrol return system. The engine bay looks a bit tight in the above pic, and it indeed is rather tight. There wasn't even space to fit the 2 reducers in the area between behind the front bumper forward of the osf wheel (like I have on Merc C V8 AMGs... I advised someone else on this forum about that location too) but I found another neat location on this model. 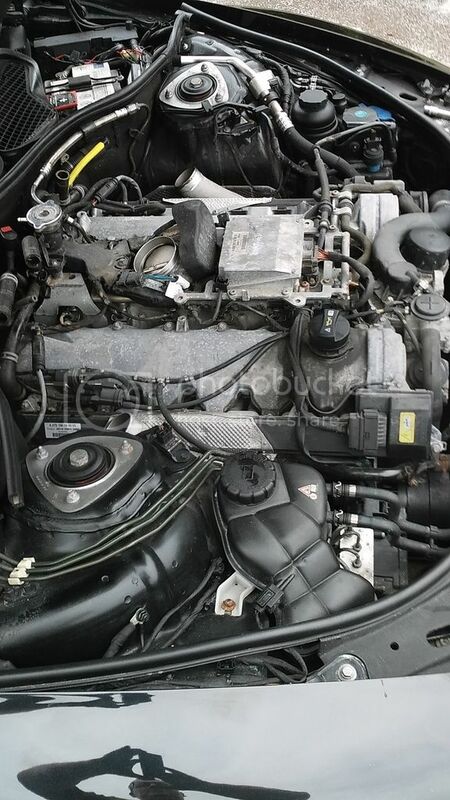 is an engine... and with the charge coolers and air filters removed it looks like a 60 degree V engine again, not daunting at all except for the lack of space to route pipes, fit injectors etc on the engine and fit the other components e.g. reducers and ECUs. The turbo manifold doesn't have anything like the length of normally aspirated engines inlet tracts, so particularly on this engine spuds must be mounted very close to petrol injectors else gas supposed to go to a discrete cylinder will go into the plenum and be distributed between cylinders. I thought I'd taken pics of both tanks, seems I only took pics of the toroidal tank fitting in progress but you can see the vent pipes leading to the cylinder tank. Oh yes, when the car arrived it may not have been making it's full 800bhp potential as I found there was no coolant fluid in the charge cooler system. I reckon there was a leak, notable by the stain shown below, which I fixed by attaching coolant pipes properly and water-tight when re-installing the water/air charge coolers and topping up the charge cooler system coolant. Sore fingers as usual doing this job! So where are the reducers! Again I must have forgotten to take pics of the final reducers install and plumbing but even if you don't read this bit there's a clue in the pic below (though you can only see one in place not yet fitted or plumbed in in the pic). You can't see anything of the reducers with the front grill in place but they don't obstruct airlfow through any radiator(s) because they are directly foreword of a tall cross-member that spans the width of the car. The pic may be deceiving, or at least the final reducer position is in front of the cross-member not obstructing the water/air upgraded charge cooler rad (bottom in the pic). The car will run totally on LPG even at full throttle when it's making 800bhp. Easy life this week, just converting a 6.3 V8 AMG with a 'mere' 500+ bhp for a different customer and repairing a few duff installs recently fitted by other installers. 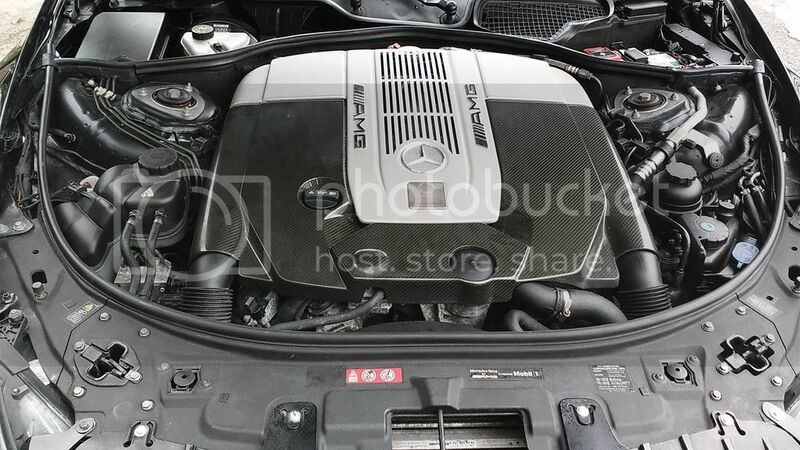 For the same customer as the V12 bi turbo AMG I previously converted a few other AMG's, like his wife's CL55AMG 5.5 supercharged V8, and his own 5.5 none supercharged V8 CL AMG, fairly easy in comparison to the V12 bi turbo. Owner reckons one of the reasons he decided to buy the car was because I seemed enthusiastic about converting it! 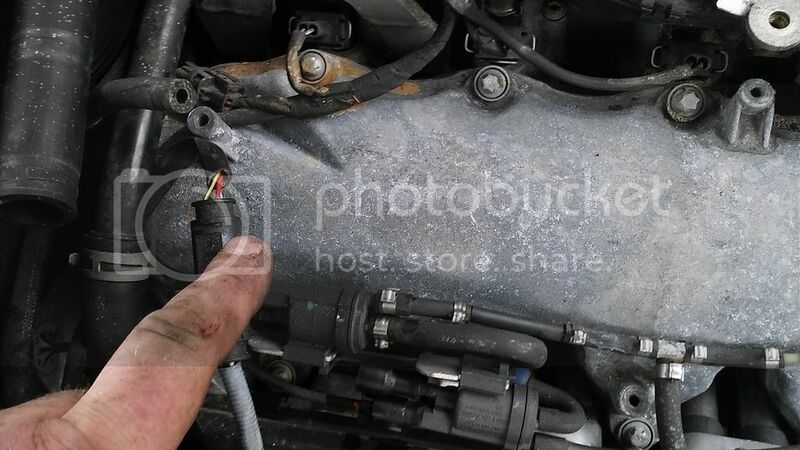 Looks like the ML I'm on with now will need a return too, but I may try to get hold of a fitting to screw onto the rail's pressure test/bleed valve because the flex section of pipe between the body and engine isn't a discrete component, it is permanently attached to the steel pipe to the fuel pump. I already tried every strange type of fitting I have and couldn't find anything to fit the fuel bleed valve though...Anyone any ideas where I might get a pipe tail that will fit the fuel rail pressure test/bleed valve? 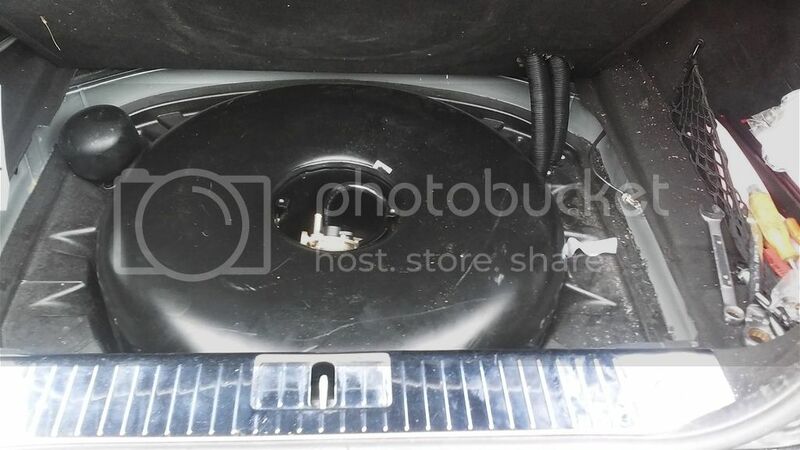 Thinking about buying a generic fuel pressure test kit (with many various adaptors about £55) and donating the Merc hose tail that comes with the pressure test kit to this LPG conversion. Last edited by LPGC on Sun Apr 16, 2017 6:00 pm, edited 6 times in total. Great write up and pictures Simon. What a beast of a car, can only dream of what 800 bhp is like under your right foot. Simon is there any chance of have look at my last post - re alfa romeo. Thanks. I just replied on your thread. Can't see any lpg injectors in your pictures, where are they? Did you have remove the inlet manifolds? Did you have to set it up as 2 different systems but try to end up with the same readings? 57jam89 wrote: Can't see any lpg injectors in your pictures, where are they? The 5th pic down (just before the tank pic) shows the driver side of the inlet manifold, the individual injectors are installed directly onto each of the manifold's port runners, except they're not in the pic because I hadn't fitted them when I took the pic! 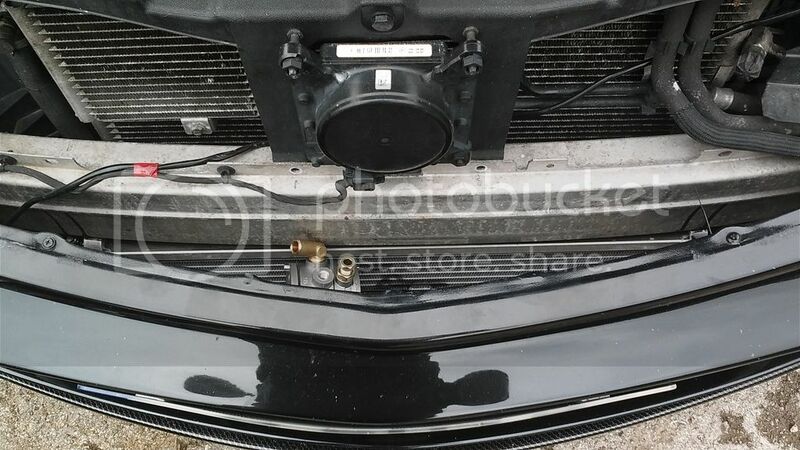 Normally you won't see them because they are below the charge coolers and air filters but with the engine cover off you can see the 4 gas distributor blocks that feed the injectors. 57jam89 wrote: Did you have remove the inlet manifolds? Didn't have to but did. 57jam89 wrote: Did you have to set it up as 2 different systems but try to end up with the same readings? Should always end up with the same readings. Only really need to calibrate one side, then copy the config file to the other ECU and see how that bank behaves. If there were any more than very marginal difference in how the 2 banks behaved with the same config file then it would be likely the setup/config was wrong in some way - Or to look at it in a slightly different way, if you use the same components and config on two identical engines and fuel trims remain about the same as they were on both engines when switching between fuels that's a strong indicator that the install/config are just right, with the twin ECU twin install on this vehicle it's almost as though 2 separate installs on 2 identical vehicles have been done thus if trims remain same on both banks of cylinders it helps confirm the LPG setup is very good. Once that's confirmed one ECU is set as master and the other one set as slave (to allow one changeover switch to be used and make it so both systems switch back to petrol if one system runs out of gas), then there are further checks to see how it all behaves when the full engine switches between fuels. Last edited by LPGC on Fri Mar 08, 2019 11:36 am, edited 1 time in total. As I write 10/01/17 an installer that I don't know is contemplating converting a similar vehicle to this. I know this because the installer's supplier has phoned me once a day for the last few days specifically to ask me how to do it, so that they can pass the info on to the installer. The installer, who apparently usually fits Prins or BRC, intended on fitting Prins or BRC on the vehicle in question but will now be fitting KME Nevo based on a tip I gave the supplier. I gather the only other system the installer has fitted besides Prins and BRC is LPGTech, which is system which the supplier usually recommends leaving to calibrate itself using it's default 'Tech mode'. 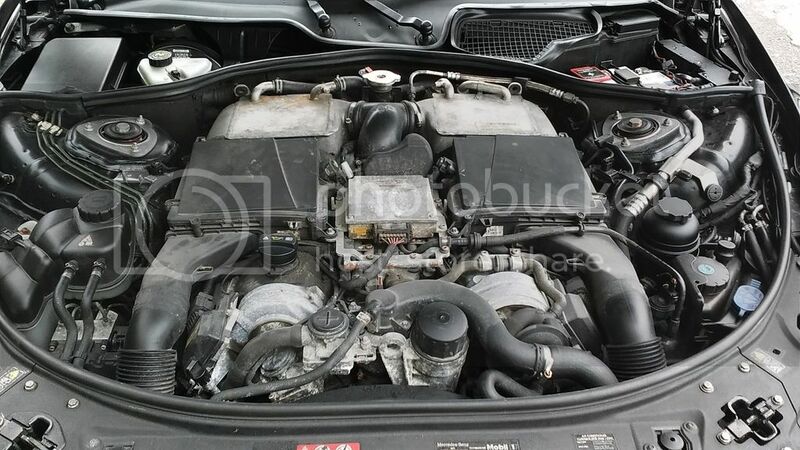 I found out today that the car they're about to convert isn't the same spec 6.3L V12 bi turbo as the car that this thread is about, it is the older 5.3 V12 turbo, which is a lot easier to convert properly, so there is a good chance that they will achieve decent results (if this installer attempted to convert the same spec car that I converted in this thread I wouldn't expect them to achieve anything like decent results). I'm being a bit coy with the supplier, who told me they will be looking back at my previous orders to see what parts I fitted on the car in this thread. But even if I went into detail on what I fitted and how I fitted them, if this were a CL65AMG and they fitted everything exactly the same as I did they still wouldn't be able to realise the same results. Supplier 'If they struggle can they phone you', me 'Tell them they can bring it in and I will sort it'. I don't know them, so not something they're going to get full credit for if they need to pick my brains, not when (as case is likely to be) they will have been advising people for years that they're great at the job / fit the best equipment / should be given the work over others because they're members of UKLPG. Me and a few other good installer mates swap tips all the time but this is a different situation. In the meantime I expect the installer will be giving the customer every impression that they know exactly what they are doing and the customer will be completely unaware of what's going on. The supplier, however, is already contemplating involving KME's top tech guy.. I don't think he'd give me much of a run for my money either. Further irony is that I dare say my customer with the Merc on this thread wouldn't have minded having a chat with the owner of the Merc about to be converted, and I would have charged less than this other installer. I just restored my opening post on this thread... now that it won't be of much use to some competition who were trying to convert a similar model and wanting to pick my brains without giving me any credit. Turns out the model they were converting was a different model and far simpler conversion prospect than this car anyway, just as well for them because I wouldn't fancy their chances at getting anything like good results on this car. Nevertheless they and their suppliers still intended on picking my brains for the conversion they were trying to do. I don't know if they ended up converting that car but if they did then the chances are I will see it at some point to get it running properly on gas, and perhaps then do a thread on it on forum explaining what I did to put it right, how much cheaper I would have charged to convert it properly in the first place, how much out of pocket the customer is having paid above my prices for the initial conversion and then my fee to put it right, how long the customer put up with multiple return visits to those that converted (and perhaps other installers) before finding me for it sorting properly.